Let us guide you to the very best holidays in France with our brand new guide, featuring 180 pages of high quality and inspiring editorial and imagery. 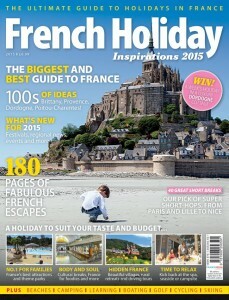 French Holidays Inspirations 2015 provides a comprehensive, ideas-packed guide to classic breaks, as well as niche and new holiday ideas across France. Love to get out in the French fresh air? We have activities such as boating, cycling and golf covered. There’s plenty for culture vultures and city breakers, too, plus lots of great ideas for family breaks including theme parks, zoos and attractions. We whet the appetite of foodies and wine lovers, provide a guide to markets and festivals and also get off the beaten track with guides to driving, railway holidays and visit some of France’s most beautiful villages. And if you want to get creative, there are loads of ideas for photography, art, ‘me time’ escapes and tempting snapshots of some of France’s most unusual accommodation. Whatever you love about France, there’s a fabulous French holiday made for you! Visit the French Holiday Inspirations website to purchase your copy today. This publication can also be found in your local WH Smiths store.